You Call…We Haul / Palletized Trucking Inc. You Call…We Haul – Palletized Trucking Inc. It isn’t every day that we get to move a part of history! 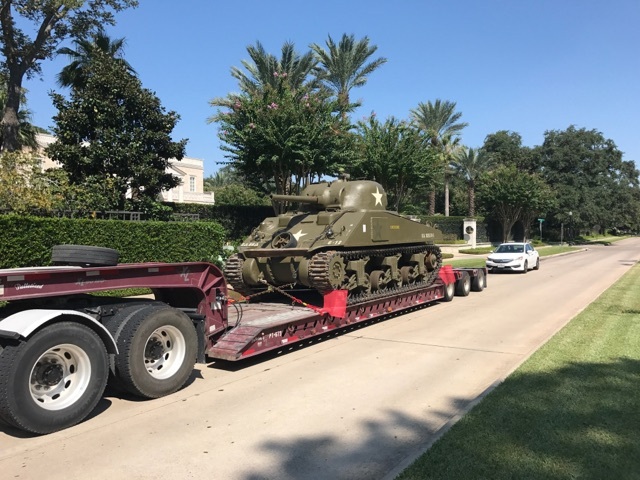 And that is exactly what we did when hauling this M-4 Sherman Tank this week from the Port of Galveston to River Oaks Boulevard. Fox 26 News Houston was there to film- click the link below to watch! Ford Motors manufactured nearly 50,000 of these medium sized tanks during WWII. This Tank was also featured in the film, Fury, starring Brad Pitt. Check out this FOX News coverage of the move! previousSeptember 2017 Employee of the Month!